LC SmartGlass provides instant privacy at the flick of a switch. Users can immediately switch the LC SmartGlass window from clear to private (opaque) and vice versa. SmartGlass International, manufacturer of intelligent LC SmartGlass provides added value and increased flexibility in new build and refurbishment hospital designs, helps reduce HCAIs, improves working environments and increases the well being of occupants. LC SmartGlass provides healthcare patients with privacy and dignity allowing them to be protected at all times in a clean and safe environment which is proven to speed up recovery time and improve general patient well being. 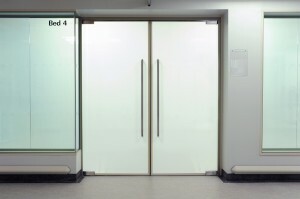 LC SmartGlass offers a sheer, easily cleaned surface replacing traditional blind systems which are difficult to clean & maintain and high risk in terms of harbouring dirt and bacteria associated with super bugs such as MRSA. Critical care nurses provide around the clock bedside care and monitoring for patients resulting in an increased risk of cross-contamination. LC SmartGlass provides a solution to this problem and is particularly effective when used within an isolation ward as care staff can review patient well being without actually having to enter each isolation unit, risking cross-contamination. Instead, observation procedures are carried out using a safe, efficient system putting patient safety and well being at the forefront by largely reducing the risk of infection. In the CCU, the preferred design is to allow a direct line of vision between the patient and the central nursing station. In CCUs with a modular design, patients should be visible from their respective nursing substations. LC SmartGlass can be switched from clear to obscure instantly from the nursing station to improve patient supervision and observation on the ward in an efficient manner. In this instance, both the nurse and the patient have control over the smart glass screen and can control it according to their requirements. Every effort should be made to provide an environment that minimizes stress to patients and staff. 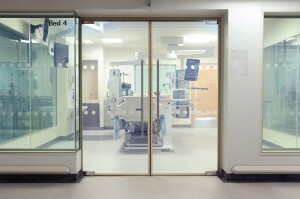 Therefore, hospital ward design should consider natural illumination and view. This can be achieved through using LC SmartGlass where the patient can control his/her view of the hospital ward at the flick of a switch or by remote control. Lighting is such an important aspect of sensory orientation, open space and bright areas help to reinforce day/night orientation for patients and can aid recovery time immensely. The comfort of CCU patients is a primary healthcare goal; LC SmartGlass delivers control over privacy, comfort and safety creating a peaceful recovery environment for CCU patients while reducing the risk of spreading HCAIs. This entry was posted in Articles, Blog, Smart Glass News and tagged electric glass, electric privacy glass, Electronically Switchable Glass, Intelligent Glass, LC smartglass, Privacy Glass, smart glass, smartglass, SmartGlass International, switchable glass. Bookmark the permalink.